In this instrument a turned ivory box opens to reveal two instruments, one for surveying, the other for telling the time. In the lid is a magnetic compass, with a scale of degrees marked with initials of the Mediterranean winds, and gilt decoration beneath the magnetic needle. 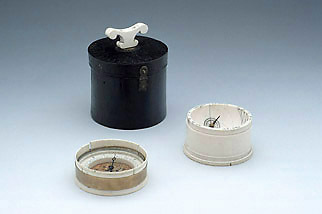 Sights cut into the ivory rim allow the lid to be used as a surveyor's cross or for taking horizontal angles by the compass. There is a scaphe sundial in the base, where the hour lines are engraved on a hemispherical concave surface, with a projecting point to cast the shadow and a small compass for orientation. The system of hours used here is known as Italian hours, reckoned from zero at sunset to 24 at the following sunset. The dial has been projected for latitude 45 degrees.